When vinyl-liner pools first appeared more than half a century ago, they were offered as “standard” pools for middle-class consumers – plain, simple and relatively inexpensive compared to their concrete cousins. Back in the 1950s and ’60s, these vinyl-liner packages had squared-off shapes, but as time passed and consumers demanded greater variety, models emerged with oval forms or Grecian-style ends; before long, there were kidney-shaped packages and even some that looked a bit like mountain lakes. 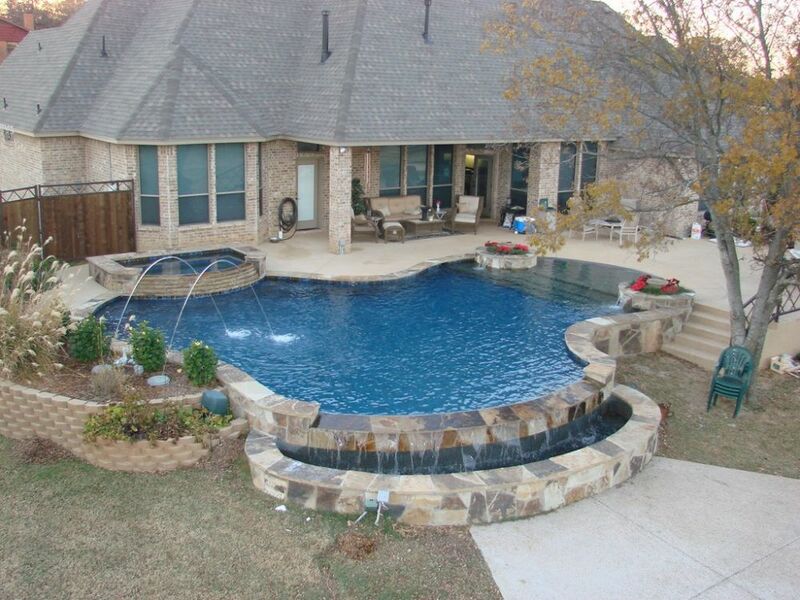 Whatever the shape, they were still vinyl-liner pools – nothing truly custom (or customizable) about them. Those constraints, however, are very much a thing of the past. 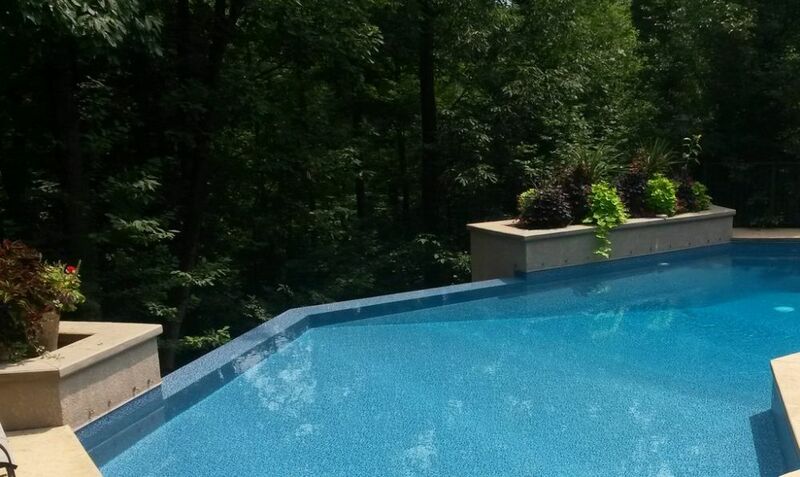 These days, vinyl-liner pools are virtually unlimited with respect to shapes, contours and sizes, and in recent years they’ve started incorporating in-pool features closely associated with the latest trends in custom concrete watershape design. This includes everything from tanning ledges and full-length vinyl covered step systems to grottos, fountains, swim-up bars and specialty benches with jet inserts. Indeed, package pools are setting new “standards” for themselves almost daily – and consumers love it, because these new looks include features they’ve seen on their travels to great resorts or in the backyards of their lucky friends and neighbors. The trend toward resort features for vinyl-liner pools began with radically new approaches to humble pool steps. Back in the day, the step units provided by package-pool manufactures were hung on the exterior of the pool – pushing past the wall contours and without lining, so they stood out visually in ways that could never be aesthetically pleasing. Utilitarian was the word, and dull and awkward was the result. This was clearly in marked contrast to concrete pools, where steps flowed with the contours and put people sitting on them in the middle of the action instead of confining them to a strange niche. And those concrete steps could be large enough that several people could sit on them at once, escaping from the heat and within easy reach of children learning to swim. And of course, they gave everyone easy access to and from the water. Change came slowly to vinyl-liner pools. There were various attempts to make things visually and physically more interesting, but until relatively recently, steps continue to stand beyond a pool’s basic contours. It took a while (and a rethinking of the basic product) before manufacturers found a better way. The breakthrough came when computer technology began allowing manufacturers to fit liners over the multi-planed contours of various step configurations – all without wrinkles. Ever since that key capability snapped into place, there really have been no limits to what can be done other than a designer’s imagination. The steps can be radiused or straight, can reach partway down a length of pool wall or span it from one end to the other. Whatever the need, liners can now be made to fit without wrinkles. The gain here, of course, is that there’s no longer that awkward visual break that once made steps in package pools stand out so blandly. By blending the steps into the field defined by the liner pattern, they look much better. And if there’s a safety concern, the steps can be marked with solid-color strips welded onto the vinyl at the step’s edges – an approach not unlike the tile borders added to concrete pools. In addition, most manufacturers now offer textured materials for their steps, making them less slippery while keeping up the visual consistency. 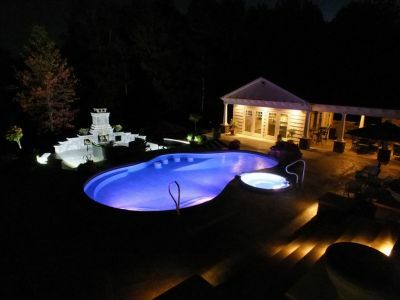 Once the technology reached a point where a vinyl liner could be made to fit “custom” contours without wrinkles, a floodgate opened and, ever since, vinyl-liner pools have been much less predictable than they once were. Now, for example, many package pools include the safety ledges and seating coves that were once exclusively the province of deeper areas of concrete pools. 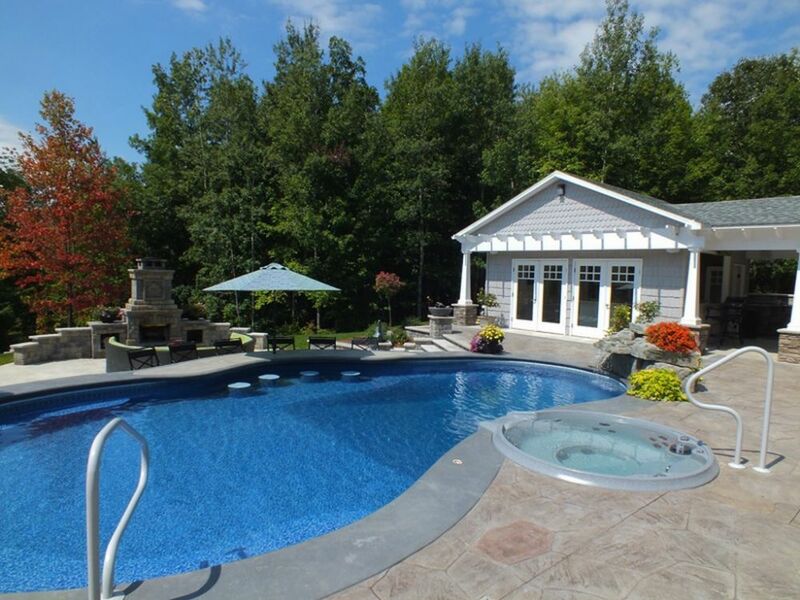 Designed so swimmers can pull themselves out of the water in the deep end to sit – or just hang onto while treading water – these features are now common in vinyl-liner pools. In some cases, these ledges or coves are placed under waterfalls or tucked beneath slide exits to create grotto effects or provide for hydrotherapeutic neck and shoulder massages. Being close to cascading water has always been high on consumer wish lists, and package pools are now definitely a part of the conversation. For the ultimate in creature comforts, the walls above these ledges and coves can also be outfitted with massaging spa-type jets – yet another way resort-style comfort features are becoming part of the package-pool vocabulary. That lexicon also now includes swim-up bars. Long a popular feature of concrete watershapes in both resort and backyard settings, in-pool stools are now appearing in more and more vinyl-liner pools – and the experience can be enhanced by including umbrella stanchions near the water’s edge and by setting stools outside the water on the same level as those in the pool. Sun decks (or thermal shelves or tanning shelves) have joined the fun as well. Serving as splash areas for kids or for adult resting or reading, these broad, flat expanses are popular with homeowners – and another package-pool feature made possible by modern liner-fitting technology. These areas can also be outfitted with tables and umbrellas, making them great places to enjoy snacks and beverages while beating the heat. When it comes to deluxe features that have moved from resorts to concrete backyard pools and have now stepped into the realm of package pools, perhaps none are more welcome than these two: beach entries and vanishing edges. Having a pool mirror the effect of walking into ocean, sea or lake water across a sandy beach has been a consumer “hot button” for many years, and these features are now possible with vinyl-liner pools. They are particularly popular among families with young children because they let the kids approach deeper water as their comfort levels rise. It’s also great for “gradualists” who like to take their time in getting accustomed to the water’s temperature. As for vanishing edges, which have proved to be much more than a fleeting 1990s fad and have now found applications with swimming pools in all sorts of settings, the availability of these features is been a major step forward in package-pool design and technology. To be sure, these are not “standard” options with package pools and demand a greater investment on the part of the homeowner as well as greater skills among installers. For all that, however, a vanishing edge is a truly custom feature and the fact that it’s now attainable with a vinyl liner is a significant advancement. Back in the 1950s, most pools (even of the custom concrete variety) were mostly about swimming and diving rather than comfort and aesthetics. Now, by contrast, they are gathering places for families, social hubs for children and their friends and places to relax and get away from hot weather and the daily grind. Outdoor kitchens are often parts of these environments, and “outdoor living” has come to mean much more to consumers than ever before. Sped by progress in liner-fabrication technology, today’s package pools offer homeowners access to the latest design trends, bringing upscale, resort-style features to middle-class backyards and even appealing to high-end tastes. They’re not your parents’ package pools, and that’s a good thing. Fun, too.